Depending on how quick you are at prepping! A simple, budget and very tasty classic stand-by with the choice of either soya-based veggiemince OR whole lentils - and with everything available from a health food shop or supermarket! (Vegan mince brands: Linda McCartney, Fry's, Vivera, The Meat Free Farm, Naturli, Meat the Alternative, Ocado, Granose and lots of supermarket own-brands. Quorn mince is not yet vegan. There are also packet Bolognese mixes if you're in a real hurry!). PS Veggie mince is also a great basis for chilli, shepherd's pie and other such dishes! It's particularly useful if you are cooking for a mixture of veggies and meat-eaters as it has a familiar taste and texture. Add the celery, red pepper (optional), courgette and mushrooms and cook until the mushrooms are golden brown. If using the veggie mince option, add it now along with the tomato puree, red wine, passata, herbs, syrup and stock. Also, if using the nut or seed butter option, add now, stirring it around so it melts in. If using the lentils then add all of the ingredients mentioned (apart from the veggie mince) but leave the lentils until stage 6. Simmer for 10-15 minutes over a low heat. If using the lentil option, add them now and let them cook in for a couple of minutes, stirring well. 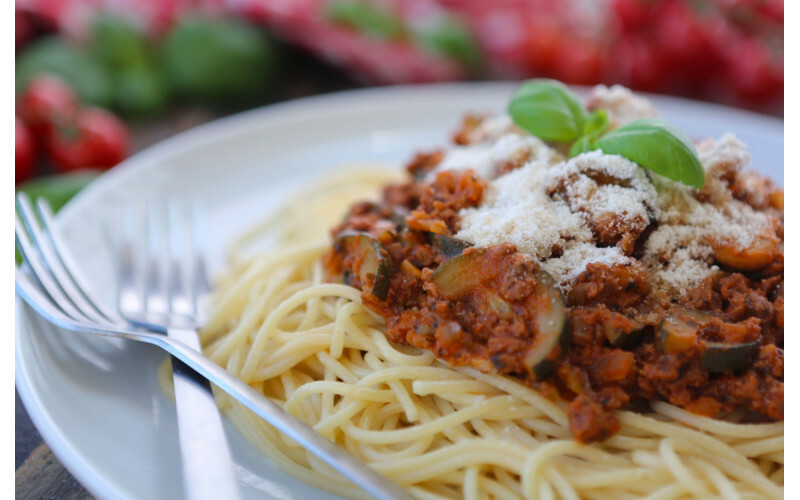 Serve on a bed of cooked spaghetti (allow 100g dry weight per person). Optional serving suggestions: vegan Parmesan (eg Violife Prosociano, Angel Food, Follow Your Heart), chopped olives, fresh basil, fresh rocket, garlic bread, side salad.